San Francisco has the concept of Privately Owned Public Open Spaces – ‘parks’ built as part of new developments. This was set out in the 1985 Downtown Plan but it has been proposed that the requirement come to an end, with a payment in lieu of setting aside the increasingly rare space. A guide to these parks has now been produced, enabling people to go to these public areas – to take lunch, to meet friends or just enjoy a calm space. There is a similar contest between public and private space in Brighton. Two of the town’s main spaces, Churchill Square and Jubilee Square, are both privately operated. In Churchill Square there is a line in the pavement separating the wide private space from the narrow strip of public land. 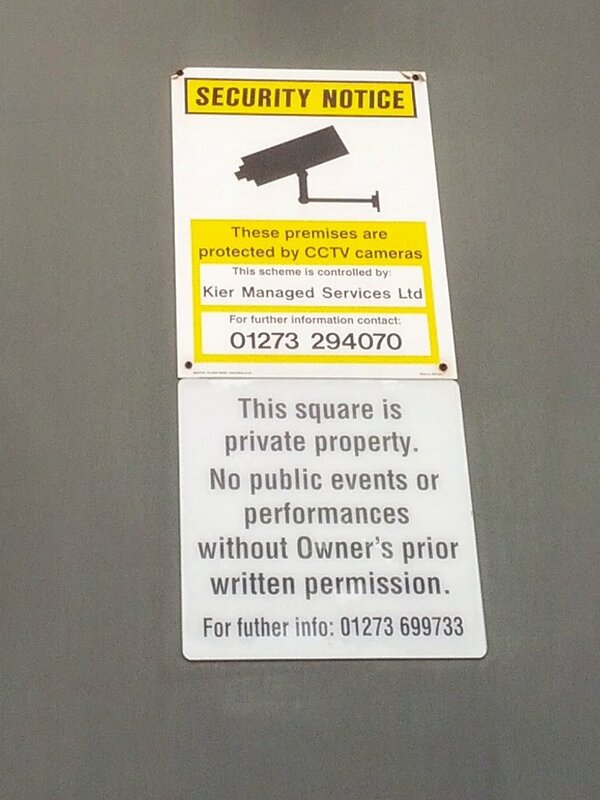 A sign on the library wall reads “No public events or performances without Owner’s written permission”. Jubilee Square has no buskers or people handing out leaflets. It is mostly left as empty space. Psychogeography has probably become a literary form because written accounts are the simplest way of recording a walk; there were other options such as maps or art, with several examples of the latter provided by the work of Richard Long. This has led to the development of psychogeography as a literature rather than following other routes. Another path that could have been taken is occultism. There is a thread taking in Arthur Machen; Alan Moore’s work on ceremonial magic and place, such as in From Hell; Alfred Watkins theory of ley lines; and the work of the London Psychogeographical Association which inspired Grant Morrison. 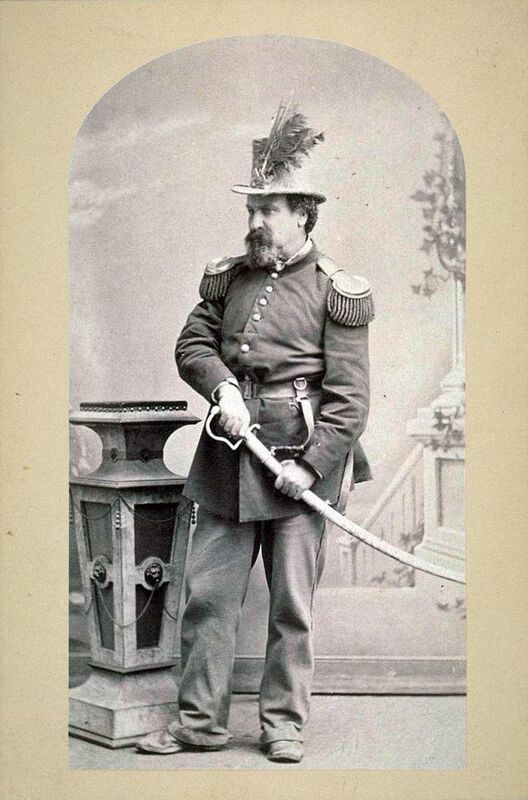 Morrison identified himself with one of the book’s characters. During an interrogation sequence that spanned multiple issues, as this character was tortured, Morrison himself became dangerously ill, almost dying from MRSA-related septicaemia. These experiences were then themselves worked into the storyline; after recovering Morrison resolved to give the character an easier time from then on. Psychogeography is a confusion of mingling disciplines, but some of the more interesting promises seem to have been neglected. What would it be like if psychogeography followed its occult influences and attempted to follow the line of magic. What if, rather than trying to craft art, psychogeography attempted to craft hypersigils, to produce changes rather than traces? A proposal to zone a city hardly seems radical, particularly when such things are carried out in most areas. These attempts to control creativity, to plan and organise it, have irritated some people, such as the artist Bill Drummond: “How dare someone tell me where the cultural quarter is? How dare anybody decide where culture can be found, or what it is, or how it can be safely packaged in a sanctioned part of the city”. Having a cultural quarter implies a restriction of creativity to a certain area. One suspects Drummond would not be a fan of Chtcheglov’s proposals. We know that the more a place is set apart for free play, the more it influences people’s behaviour and the greater is its force of attraction. This is demonstrated by the immense prestige of Monaco and Las Vegas… though they are mere gambling places. Our first experimental city would live largely off tolerated and controlled tourism. While Debord was inspired by the idea of play, particularly in relation to Huizinga’s ideas, he was suspicious of ‘leisure’, seeing recreation as a way to keep workers participating in capitalism. The “tolerated and controlled tourism” that Chtcheglov suggests is indistinguishable from this. As charming as some of Chtcheglov’s visions are, the utopian city he suggests, his Experimental Prototype Community of Tomorrow, is basically an urban Disneyland. Given that the Situationists were a movement of artists they produced few iconic images. 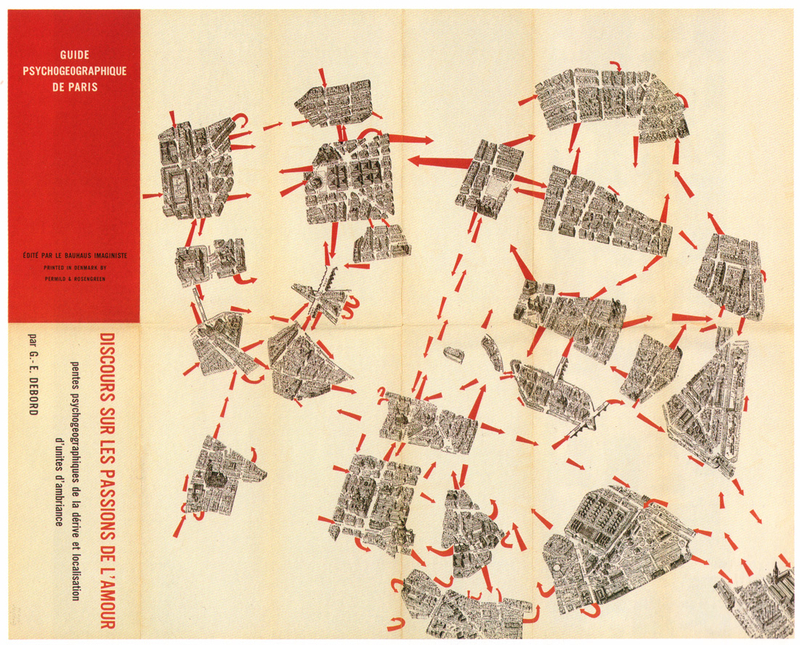 One that has emerged is Guy Debord’s Psychogeographic Guide of Paris, showing the city as a series of disconnected neighbourhoods with arrows showing the flow between them. With the aid of old maps, aerial photographs and experimental dérives, one can draw up hitherto lacking maps of influences, maps whose inevitable imprecision at this early stage is no worse than that of the earliest navigational charts. The only difference is that it is no longer a matter of precisely delineating stable continents, but of changing architecture and urbanism. 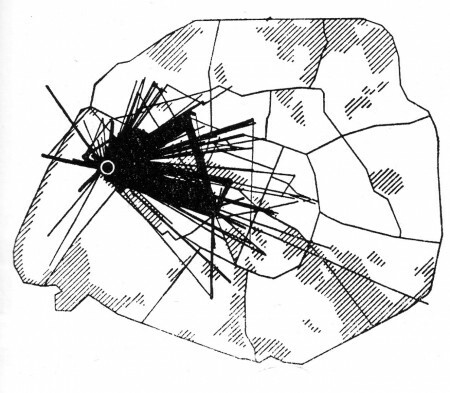 Debord was also inspired by a map produced by the French sociologist Paul-Henry Chombart de Lauwe, charting the movements made by a student over the space of a year, which shows ““the narrowness of the real Paris in which each individual lives”. ‘Proper travellers’ tend to sneer at the Lonely Planet guidebooks and, in particular, at people that follow them too carefully. Part of this is resentment at how they have produced a familiar environment in very different countries. The repetitive breakfast menus in vastly different countries have led to the creation of the Banana Pancake Trail. Wikipedia describes this trail as including Pushkar, Goa and Varanasi in India; as well as Thailand, Laos, Vietnam and even parts of China. But there are things you need to know about a country before you get there, such as how to get around, what legal rights and cultural expectations surround travellers, and which places are best avoided. It’s also good to know the local scams – while getting involved in a jewellery investment in a foreign country is foolhardy, there are elegant cons that easily capture the jet-lagged and unwary. I would never have gone to India without a guidebook but my favourite moments have been places that were a little off that trail: cities like Gwalior or Lucknow that are almost completely ignored by tourists; chai shacks at the sides of busy roads. And I’ve done better with hotels by turning up in a new city and seeing what is available. I could probably discard the guidebook and have a more interesting time without it. Perhaps the guidebooks shouldn’t list establishments but rather give you just enough information about a place before you arrive: what you should see there, places to start looking for hotels if you can’t find somewhere near the station; where to move on to if you can’t find anywhere to settle. A guide that is part of the trip rather than trying to define it. One that persuades you to go and gives you the confidence to see what happens. A few years ago I attended the first of Brighton’s traditional March of the Mermaid events. I walked in the drizzle from Hove Lawns to Brighton Pier with a crowd of people in fancy dress. At the traffic lights near the aquariums, an Italian woman asked me what the festival was and I told her. She asked me what it was for and I couldn’t say. I do know that the event was based upon the Coney Island Mermaid Parade, an event held in New York to celebrate the start of the summer. That tradition only began in 1983 meaning it is only a little over thirty years old. There are a number of recent traditions in Brighton. Pride has expanded from a small march in 1973 to one of the biggest events in the town. 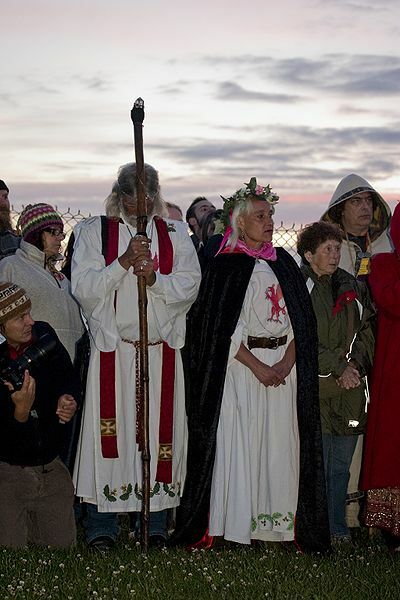 In 1993, the community group Same Sky created the Burning of the Clocks as a winter solstice celebration, intended to have “a secular format that can be enjoyed by all regardless of faith or creed”. The event survived funding cuts and even cancellation due to bad weather in 2009. Other traditions have had a few years of success and then faltered. White Night had ongoing problems with funding. Hanover Day had problems with the cost of insurance. The Brighton Christmas Day Swim is being suppressed due to safety concerns. In 2015, the Kemptown Carnival is taking a year off to “ fully explore a more sustainable model for the Kemp Town Carnival”. And, controversially, the Brighton Zombie Walk was shot in the head due to health and safety concerns because it was too successful and involved too many people. Traditions come and go. Many of the folk events that claim centuries of history are Victorian inventions and reinventions. It doesn’t matter if these events last two years to two hundred, they still chart out the year and structure the seasons. Even if they soon falter, it’s worth creating more of them.